Yui is an attractive open-cardigan featuring a unique chunky cable decorating each side of the front-neck collar. The cardigan is worked seamlessly, and is worked from the top down, making it easy to adjust the sleeve and body lengths. 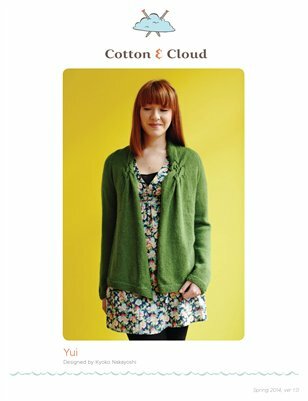 Yui is ideal for lazy knitters and for a project where you have a limited amount of yarn to work with. Make sure you don’t cut corners when increasing stitches at the cable section - as this is necessary to give the correct width at the front!